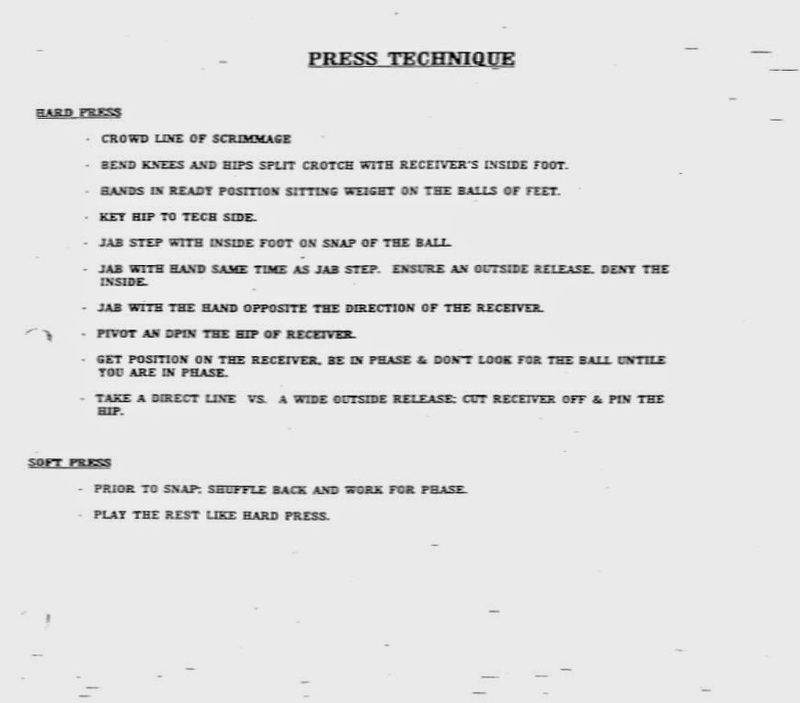 Here are some coaching points for corners playing press man coverage from the 1999 Texas A&M playbook. 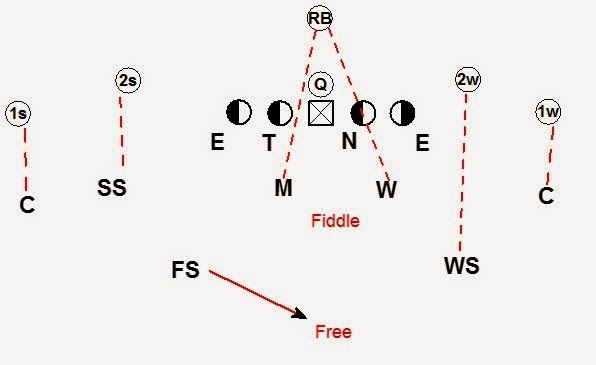 Here is a non-traditional four man pressure call. 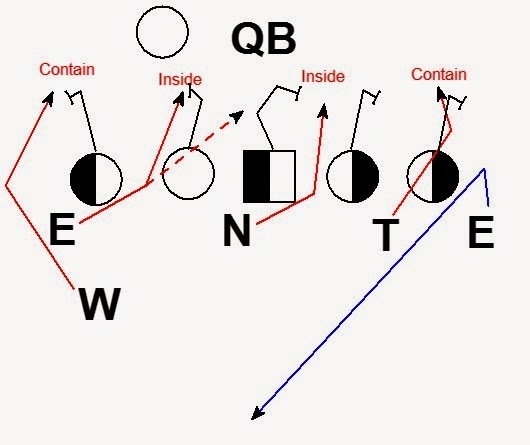 The coverage concept uses quarters versus 2x2 formations and cover 3 concept versus trips. 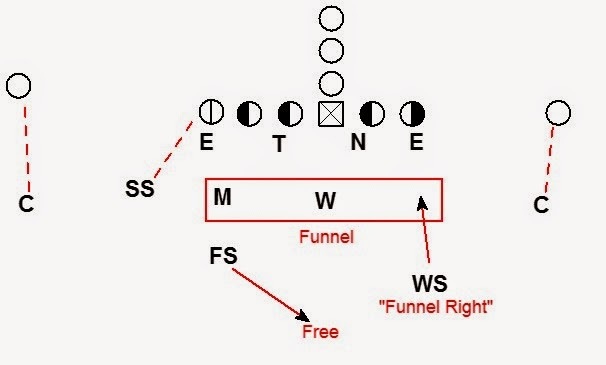 The DE drops to the Hole. The hole is 10 yards deep directly over the center. Will - Contain Blitz. Aiming point on the QB's up field shoulder. End - Long stick to inside rush lane. Two way go on the OG. Aiming point near hip of the QB. Nose - Cross center's face to opposite inside rush lane. Aiming point near hip of the QB. 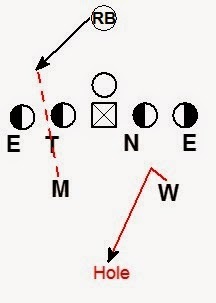 Tackle - Get width through B Gap to contain. Aiming point on the QB's up field shoulder. 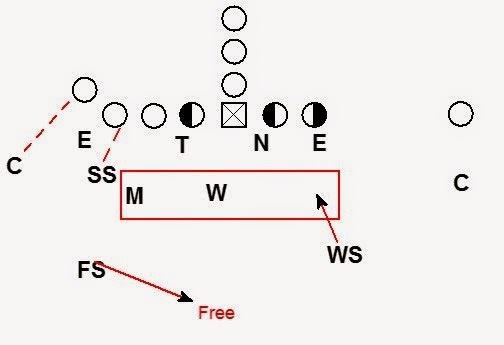 If the offense aligns in a 3x1 formation the coverage checks to a four under 3 deep zone coverage. 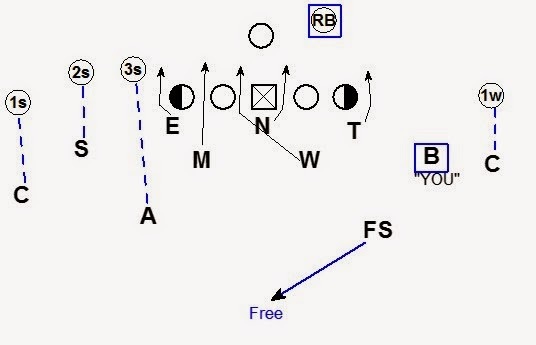 Against a 3x1 into the boundary the coverage again rotates to a cover 3 concept to the trips. 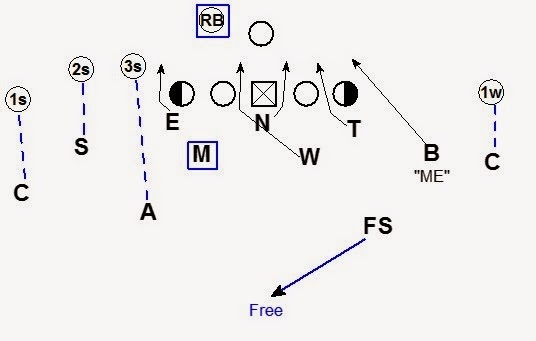 For the rush if the center sets to the blitz the Nose and End both have 1 on 1 pass rushes with space to operate. The result is the OG gets width with the DT, which creates space for the Nose. The center is forced to redirect as the Nose crosses his face. The End has a 2 way go on the guard. 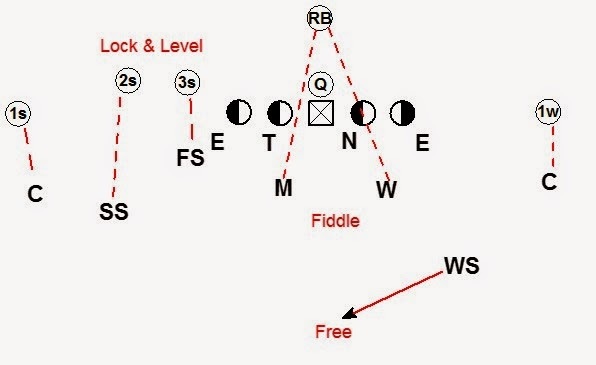 With the OG setting to DE the most likely rush for the DE is the inside move on the OG. 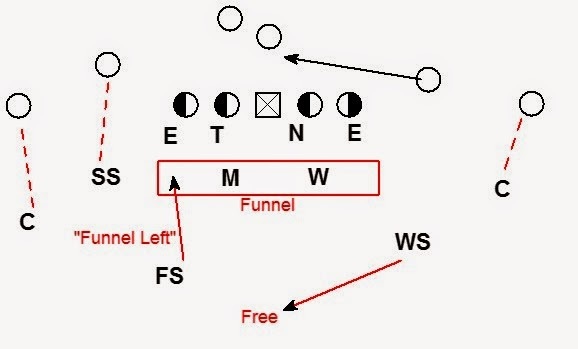 The Nose should create space for the DE's pass rush by crossing the center's face. 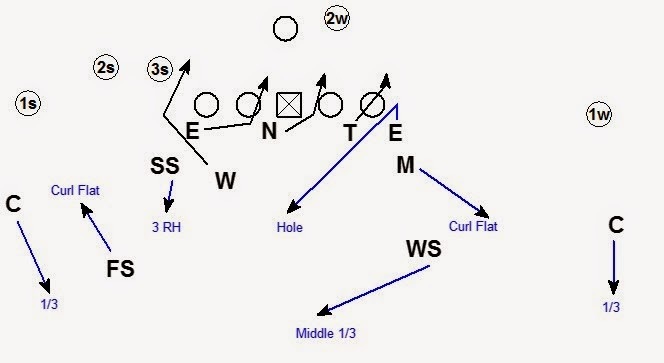 If the center sets away from the blitz the End should have a good inside rush versus the OT. The OG is focused on the Nose initially which should create space for the End. 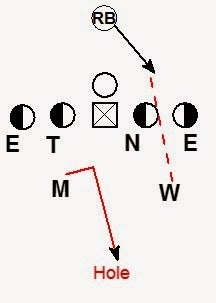 The End has to beat the OT 1 on 1 on the inside move. 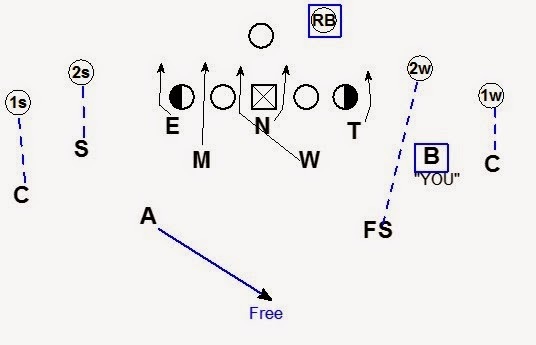 The blitzing Will typically has a 1 on 1 with the RB. 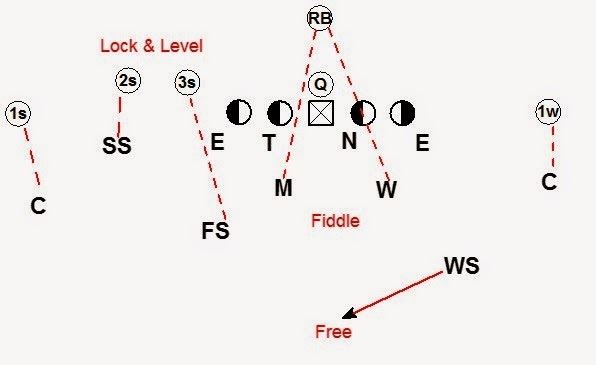 This pressure also naturally allows the defense to bluff pressure with the Mike. 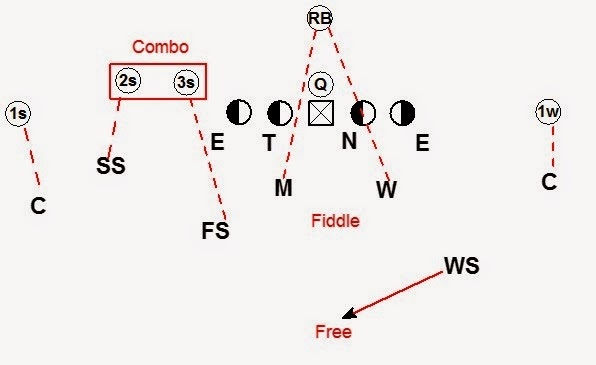 Against both 2x2 and 3x1 formations the Mike can walk up an show outside blitz while still being able to get to his pass drop responsibilities. Against the run the Will spills all run blocks to the outside. 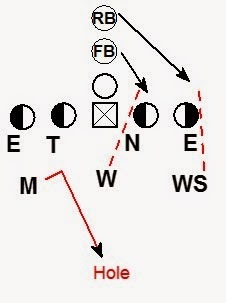 The DT plays the B gap against the run. 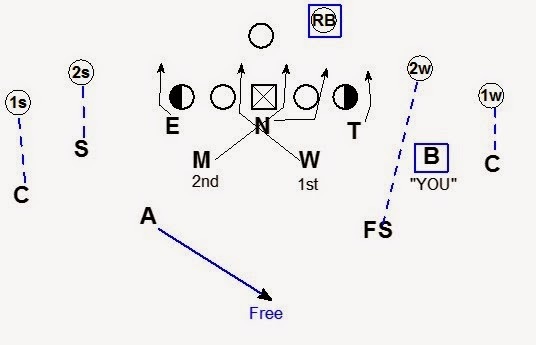 The DE does not drop versus the run and plays the C Gap. 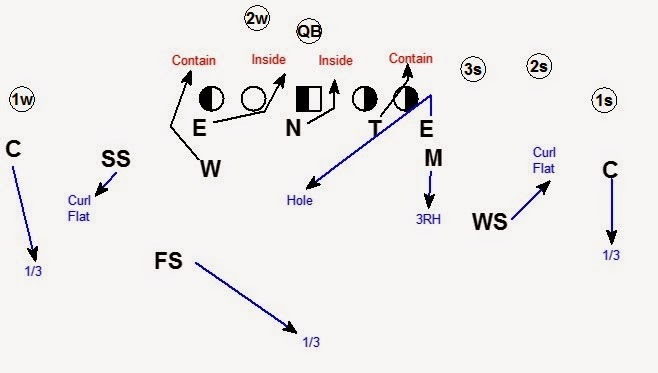 The SS and Mike handle force in the quarters coverage concept versus 2x2. 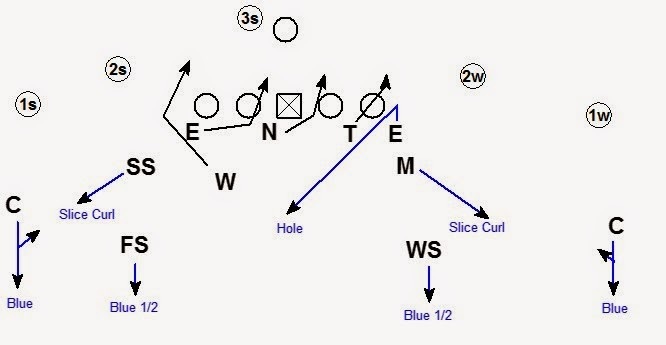 Against 3x1 formations the Curl Flat defending players handle Force. 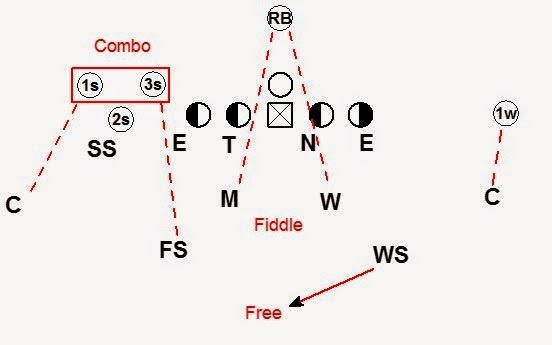 In this case the FS and the Mike are the force players. 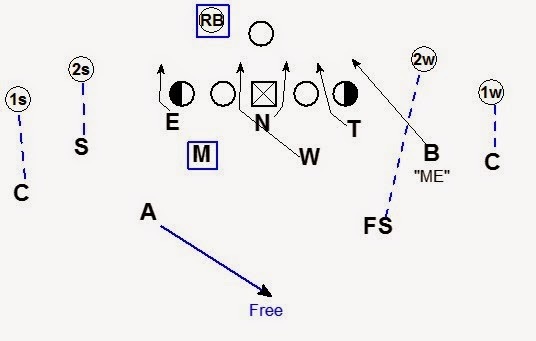 Here is a simple effective zone blitz that can be checked to from a 4-2-5 personnel versus empty formations. 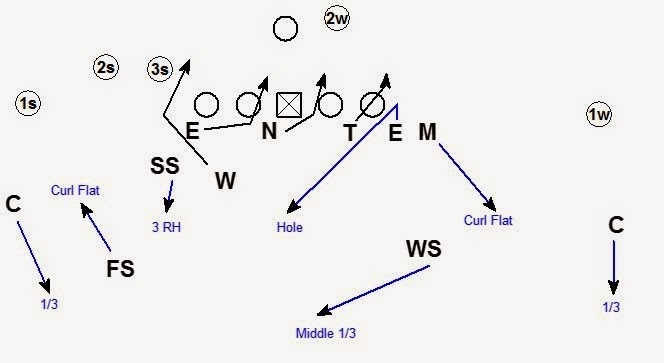 The SS can play outside leverage on #2 strong to help defend bubble to #3. 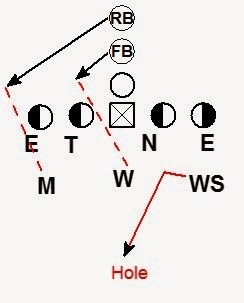 Having the LB to the #3 receiver strong allows for sound defense against the stick route by #3. 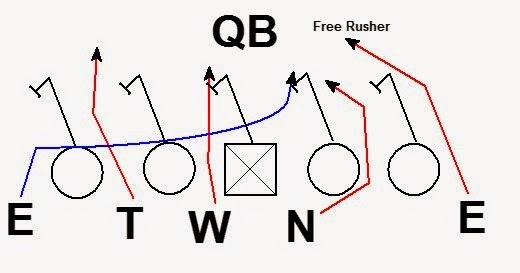 If the offense puts the strength of the formation to the boundary the LB to the pass strength is still the 3RH dropper. Call Side DE - Loop to the middle rush lane. Keep getting up the field while looping. Aiming point is the middle of the QB. 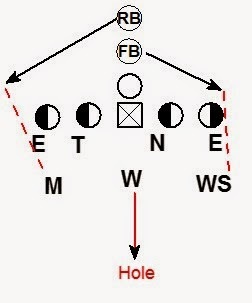 DT - Get width to contain. Aiming point QB's up field shoulder. 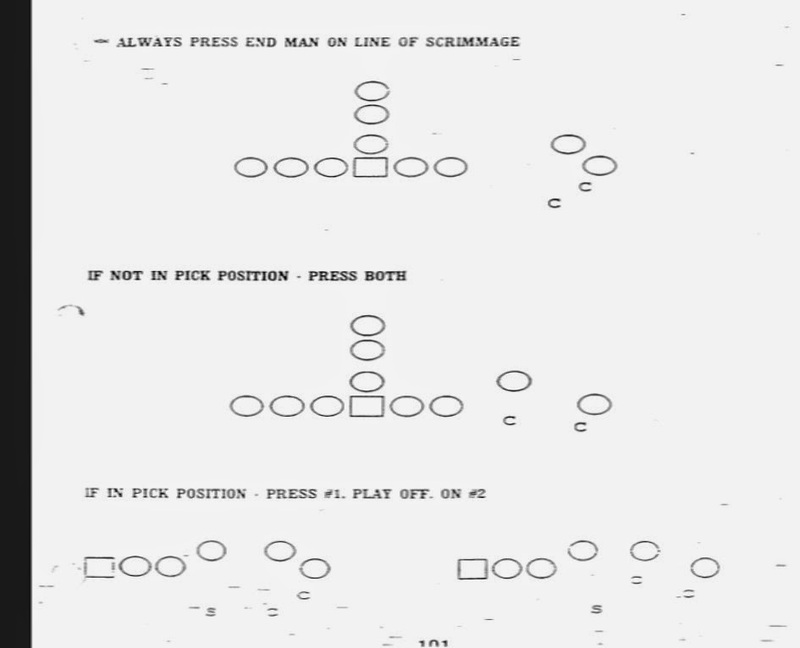 LB away from the pass strength - Align in call side A gap, Blitz A gap. Aiming point QB near hip. Nose - Cross face to the B gap. Aiming point QB's near hip. Away Side DE - Contain Rush. Aiming Point QB's up field shoulder. 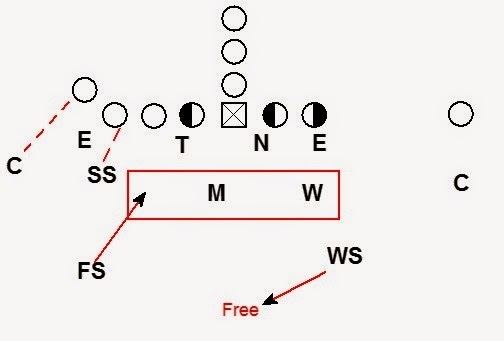 If the offense is setting the center to the walked up LB in the A gap the looping DE has a great pressure opportunity. 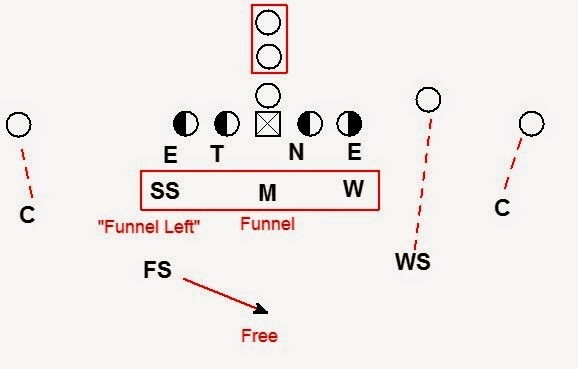 The center will be forced to get depth quickly vs. the blitzing LB. 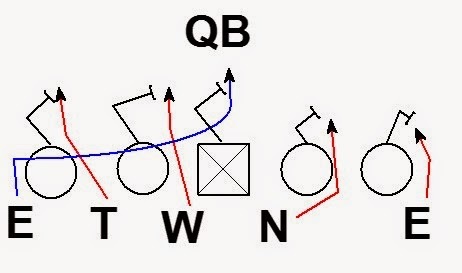 Often the center is occupied with the LB and does not see the looping end. 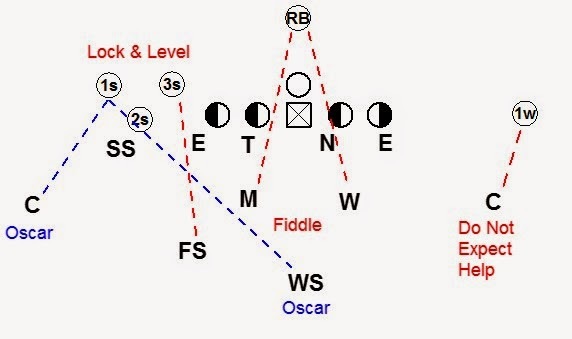 Offensive linemen are also less likely to look for a twist when there is an immediate A gap blitzer. 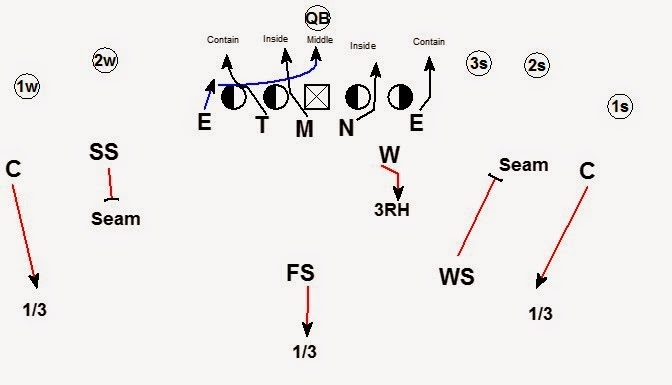 Twists are most likely to be from two defensive linemen not from two DL and a blitzing LB. The OG opposite the looper will be occupied with the nose. 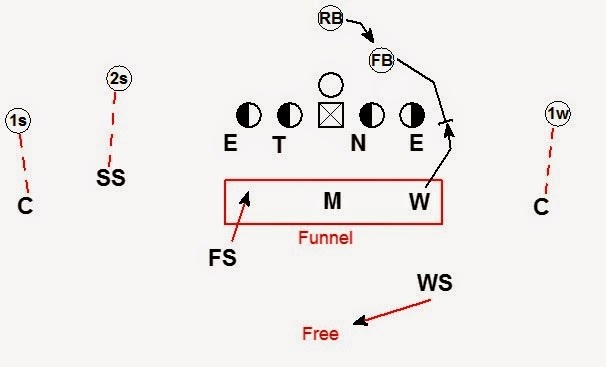 As the guard sets to the Nose, it opens up the midline for the looping DE. 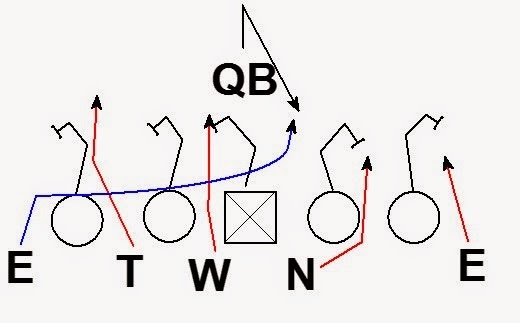 If the offense attempts to react to the looper, the OT and OG will be forced into very difficult blocks. If the OT to the loop attempts to redirect to the inside and set to the DT, he is forced to make a very difficult block on the DT. 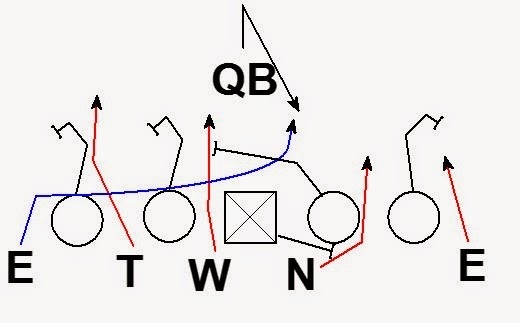 The DT has inside leverage on the OT and a direct path to the QB. 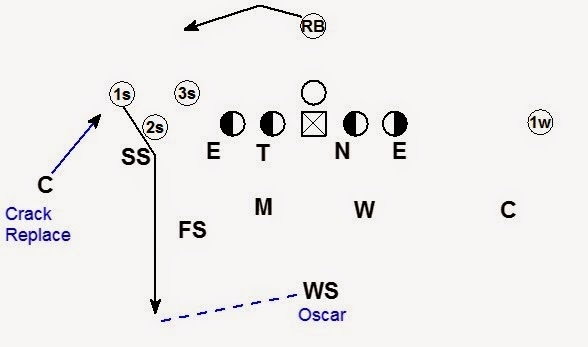 The OG has the same difficulty when redirecting to the blitzing LB. 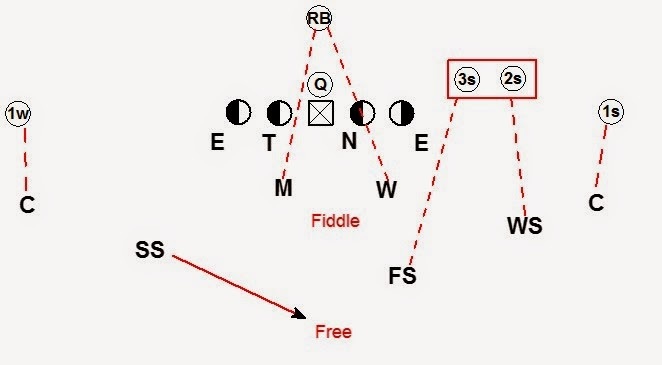 The other obstacle for the offense is making sure the OT, OG, and Center are all on the same page in exchanging the 3 pass rushers. 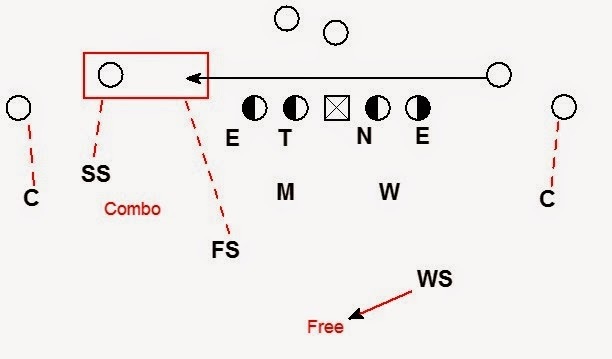 Pass protection exchanges with a high degree of difficulty for the offense are more prone to a major mistake. 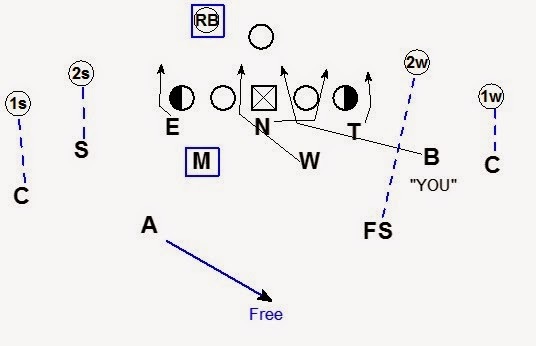 If the OG doesn't redirect but the OT and Center attempt to exchange, the blitzing LB can end up unblocked. 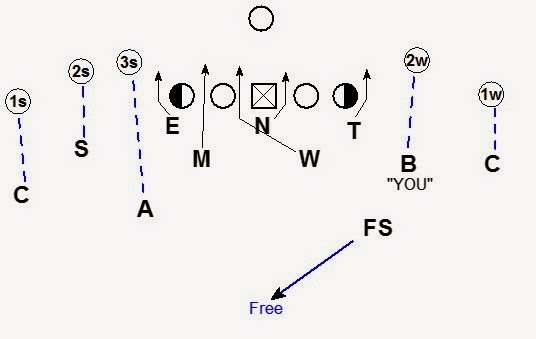 If the offense uses a full slide protection, either the call or away side DE is unblocked. 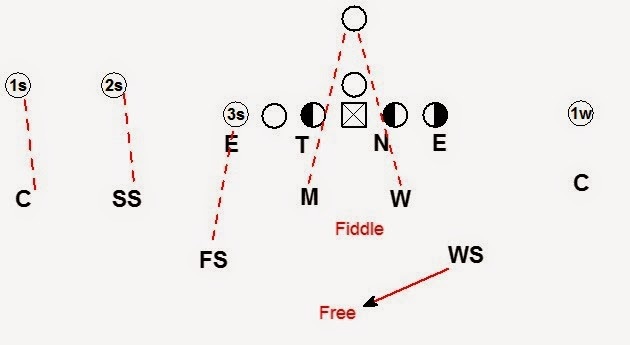 If the offense full slides to the looper, the DE opposite is a free rusher. Also the Nose has a excellent opportunity to ricochet off the pass set of the OT. 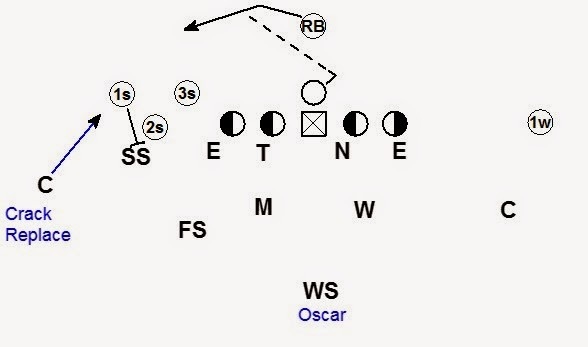 The block for the OT is difficult and creates a good inside pass rush opportunity for the Nose. 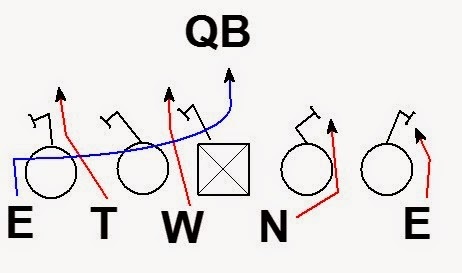 As the looping DE gets off the ball vertically, he will abort the loop if the OT down blocks. 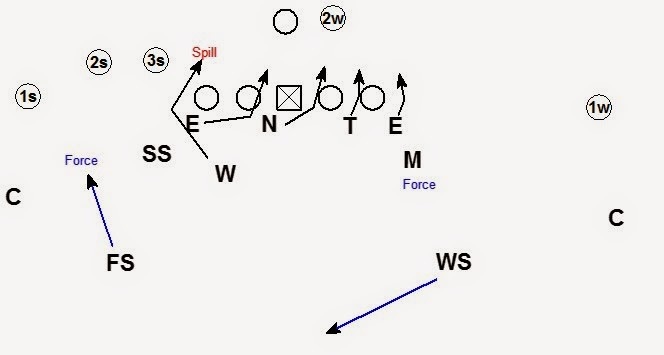 Against full slide the OT will block down and the call side DE will be unblocked. The blitz is also good versus QB draw. 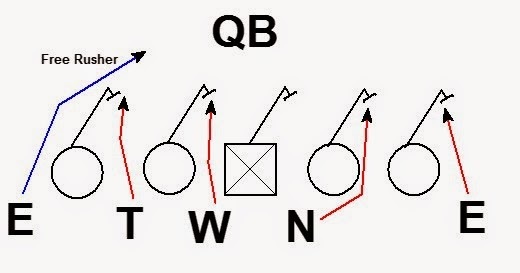 The looping DE is very difficult for the QB draw blocking. 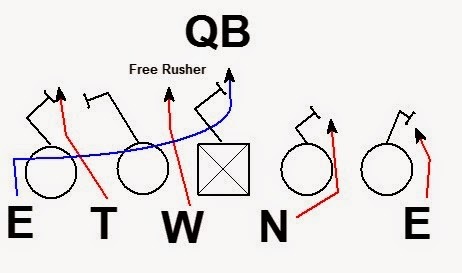 Often the looper is going where the QB is trying to run. 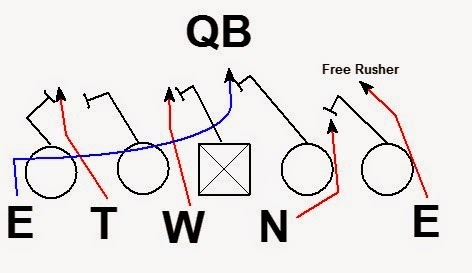 Against a pull scheme QB draw, the blitz is still good. 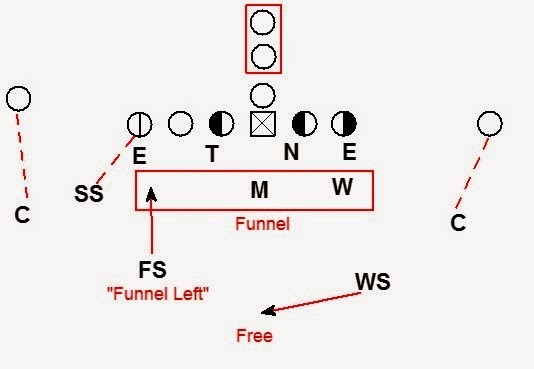 The puller has a very difficult block vs. the walked up blitzer. 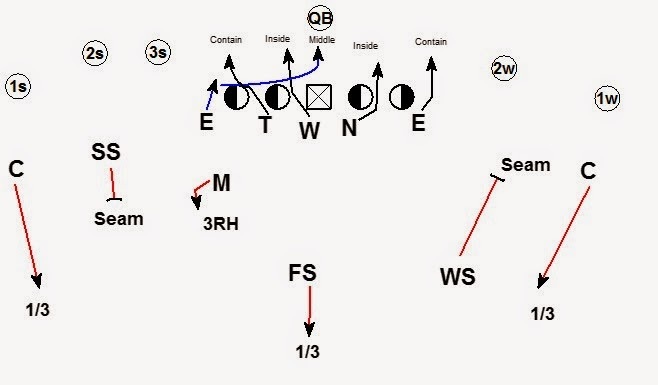 The looping DE is again going to be looping to where the QB is trying to run.